“Coffee, black.” It’s a sad day on Voyager when a replicator on the fritz gets between Janeway and her coffee. One of our favorite things to do here at 3DPrinter is speculate. When presented with some new technology or breakthrough it’s natural for the curious mind to go to town on ‘What can be done with it? How about where? Can this do that there? Then about when?’ kinds of questions. The inventive mind makes the same inquiries without the rhyming and with more math. Still, they’re important questions however asked. When those questions are asked about some technologies, like human genetic engineering, the answers can be blasphemous to some. In other cases, like nanotechnology, the spectrum of plausible answers quickly becomes similar to what Gene Roddenberry may read off of some index cards at the International Conference on the Feasibility of Star Trek Tek, if there was such a thing. It’s difficult to fathom what all can be done with nano, and gauging by the volumes dedicated to exploring its potential by thousands of science fiction writers, it’s probably a futile endeavor. Instead we’ll contemplate just a few “simple” uses. If Star Trek is any indication of what the future will be like, and I think it is, we should have personal replicators in a few short decades. That may seem a radical assumption, but in a sense we already have rudimentary replicators with 3D printers. What’s really missing is the synthetic food, and there’s progress being made. It’s not as though there’s already a commercialized frankenmeat; it’s quite possible that 3D printing is what makes that a reality. The way of the future (tacos from a machine) is a all about small. Nanobots are one avenue of nanotechnology and their applications are endless. Researchers at Aalto University discovered a new way to manipulate the shapes of objects at the nanoscale with ion beams, and since there’s already been headway made in printing at the molecular level, it’s safe to say this is where much nanostudy will bear fruit. A first-generation FoodBot may create and manage tiny swarms of microscopic nanoChefs that simply process real foods rapidly; if two tacos are ordered then a quarter-pound of meat is dispensed into an area where it’s assaulted by thousands of tiny robots that grind, perfectly season, and cook all at once in a matter of seconds. A FoodBot 2000 may have dessert features, where the FoodBot 9000 released a few years later could synthesize entire exotic meals from bulk elements (the periodic kind). 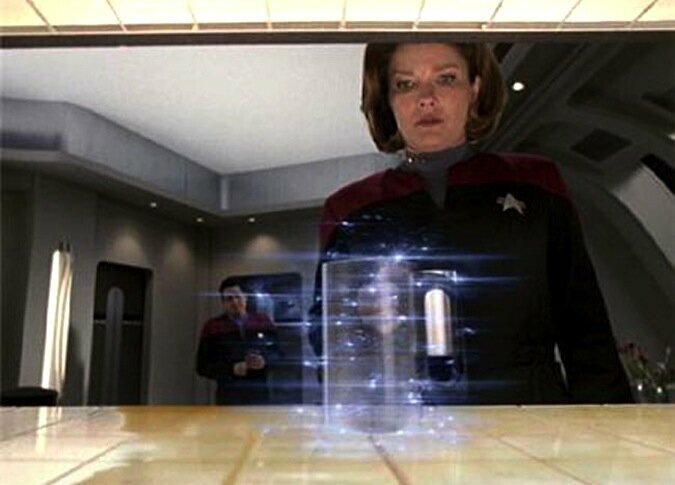 While the food replicators are developed researchers will greatly advance material fabricators too. Silk shirts will materialize at the push of a button (or a mere thought) and medical services will often involve nanobots that both diagnose and treat ailments; an injection of nanoNurses could regulate blood sugar, manage pain, increase endurance, or fight viruses and cancer. Our homes will experience a major upgrade through nanotechnology: dynamic floorplans. Furniture too. Walls and chairs will be equally changeable as they’ll be comprised of millions of carbon nanotubes and buckyballs, reconfiguring to our spacial whims on demand, so the oak dinner table could reform into a fluffy bed. All of this replicating will require significant resources and even though I’m a (lazy) environmentalist, I’m not overly concerned with Earth being stripped bare. She’ll continue to take damage in the short term while all these technologies and those of renewable energies are developed, but as they mature, the vast amount of resources outside of our comfy atmosphere become available. A company called Planetary Resources has already announced plans to mine asteroids for water and precious metals, and NASA is working on 3D printing systems in orbit that also involve utilizing space resources. At some point Mars will be colonized and slowly terraformed with help from billions of enviroBots that produce atmosphere, moisture, and fertilizer. The outer planets will likely be dismantled after the asteroid belts are depleted as we’ll continually need to convert the energy from the Sun into processing power and bandwidth to handle our ever expanding virtual simulations consisting of personality and situation clones. Processing power and bandwidth will continue to be monetized as they increasingly become bottlenecks to progress.